this is Bonny and my wheel chair. she learnt to trot beside this large chair at full speed in just a few days..
What beautiful dog Bonny is. Thanks so much for sending in such a great picture and telling us a little about her. I have always been a big fan of the Black German Shepherd Dog and have owned a few of them myself. That color is really stunning. It sounds as though she has a pretty good temperament too if she picked up on being around your wheelchair so fast. Some dogs never learn to accept new things - or take a long time to do so so she sounds like a pretty confidant dog. I hope you get the chance to train Bonny to help you as much as possible in your wheelchair. German Shepherds are tremendously smart and she could be a great partner in retrieving things for you and many other jobs around the house. I wish you both nothing but the best and I hope that maybe sometime in the future you'll send us an update on how you and Bonny are doing. 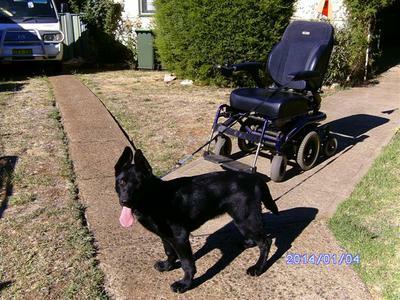 Congratulations on the acquisition of your new companion - she is one fine example of a Black German Shepherd Dog.